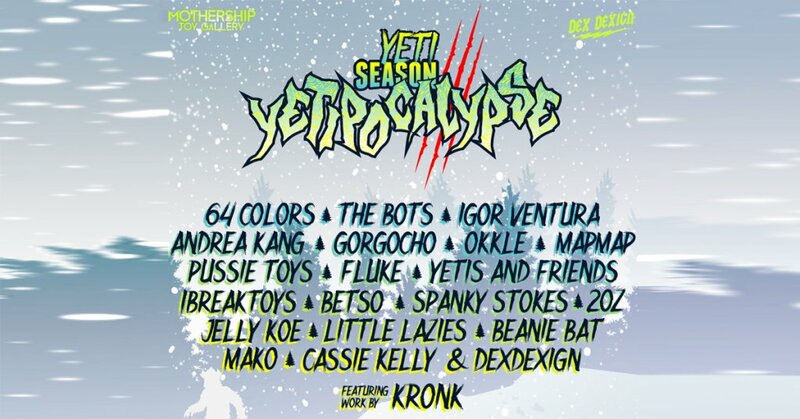 The annual Yetipocalypse Custom Toy Show is returning and ready to shake up the start of 2018! Yeti Season 3 x Mothership Art Gallery & designer toy store Presents “Yeti Season 3 : Yetimageddon” coming in January 2017. The partnership with DexDexign x Mothership Art Gallery will continue to grow strong as the show is curated By DexDexign. Phili are you ready as artists from around the world are about to embark on this Yetimageddon. Great to see our very own UK representatives included in the awesome lineup. Online sales via https://mothershipgallery.com/ after the show launches. Take a look at this 2016 Yeti Season HERE.